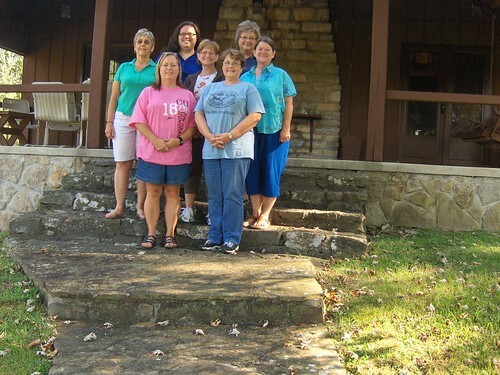 I spent the past weekend at a cabin at Center Hill Lake with my mom and her five girl friends (known as the MRS’…My Rowdy Sisters) for the second time (the first being a year ago August). 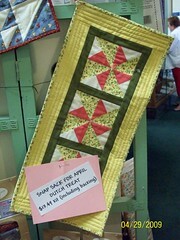 The weekend was time to work on quilting for most of us, and a couple of others worked on other crafts and reading. 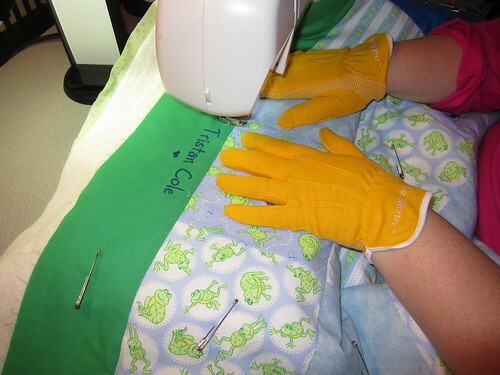 This blog hasn’t been updated since April, which is the last time I did any sewing. Yikes! Life has just been rather busy lately, and I haven’t really had good working space. So what did I do this weekend? Well, I wish I could say that I completed one full project, but the truth is that I partially finished 3 different projects. 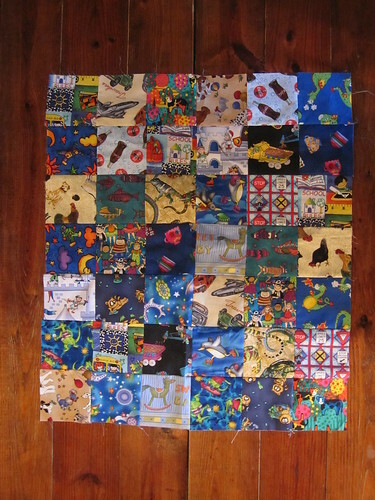 I made the top parts of two I Spy quilts for friend’s babies, but I still need to add the borders and quilt it. 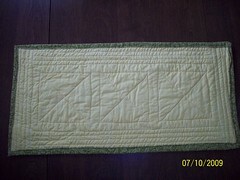 Then I did most of the quilting on a panel throw that I started for my mom last year and never finished. She’s going to have to finish the rest of it because my sewing machine arm just isn’t long enough to quilt around the design. 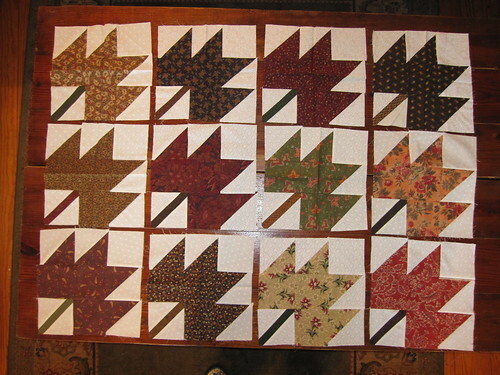 Finally, I finished the final 5 Maple Leaf blocks, also another quilt that I had started last year. I was so hoping to get this quilt finished soon, but I just now looked at the setting kit for it, and it involves piecing 26 MORE maple leaf blocks in a smaller size. At this rate, I feel like I will never get this quilt done, though I’m sure when it’s complete it will be beautiful and well worth the work. We’re already planning another weekend in March and hopefully again in September. I get so much done when we go, even though this year I feel like I didn’t get much accomplished only because I didn’t finish any one project to completion. Maybe all this motivation will stay awhile, and I’ll get even more done soon. I posted a sneak peek picture of this quilt a few weeks ago in my entry Productive Hibernation. 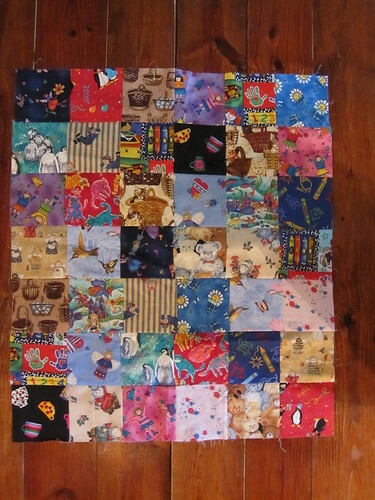 The quilt is a gift for a friend who had a baby at the end of December. 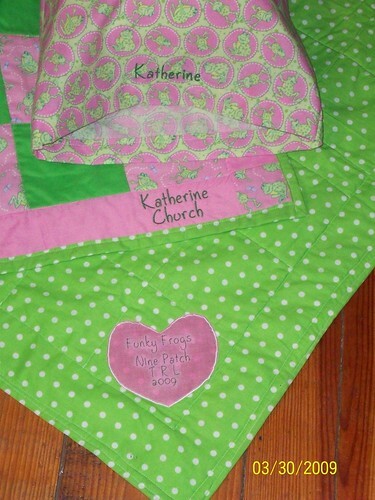 I didn’t want to write about it until I gave her the quilt, so the surprise wouldn’t be ruined. 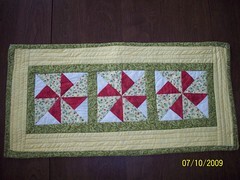 Tristan’s quilt is a very simple block design, but so far it’s been my favorite design. 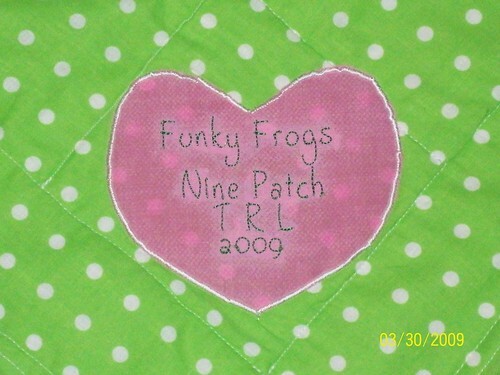 I like the large blocks for a baby quilt, and of course the frogs are a favorite of mine. 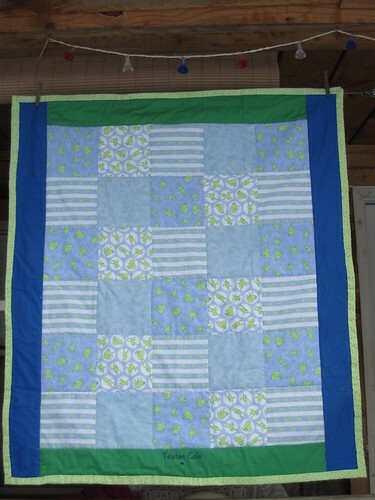 So far I’ve made two baby girl quilts, so this was my first baby boy quilt. It seems that all of my friends are having girls lately. Originally I had planned to make each baby quilt slightly different, but I enjoyed making this design so much that I think I’m going to stick with it for the others that I make in the future (with the exception of one baby quilt that I haven’t written about yet because I haven’t given it away yet. I’ll post about it as soon as she’s received it). The one unique feature of this quilt’s design is that it is the ONLY quilting project that I have actually hand stitched the binding. My mom convinced me that hand stitching the binding is the proper way to stitch binding and made me believe that it should be the ONLY way to stitch binding. I found out really quickly that it might be the way she and her friends stitch binding, but it’s not going to be the way that I stitch binding. It took me about 4 hours to stitch the binding, which is about 4 times as long as it took me to piece the quilt. You can see a close up of the binding in the last picture. 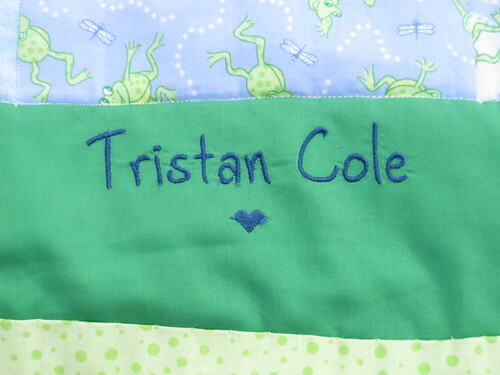 Thus, Tristan will have what is most likely the only quilting project of mine that had hand stitched binding. How about I show you the pictures now? Oh, and I forgot to take pictures of the Signature Block on the back I’ll hopefully get one later, as well as pictures of the baby on the quilt. 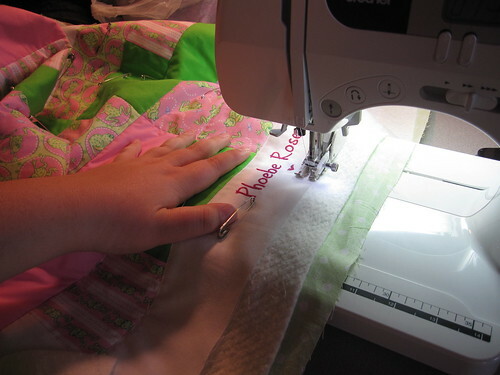 The quilting process. The gripper gloves really do help! A close up of the name embroidery work that my mom did for me. I mentioned in my last post that we rarely get snow in the Nashville area. Here I am again talking about the snow. We got much, much more this time, only 3 weeks since the last snow. I love the snow, but I can honestly say that I only want to see it once a year, then I’m ready for it to go away until next year. 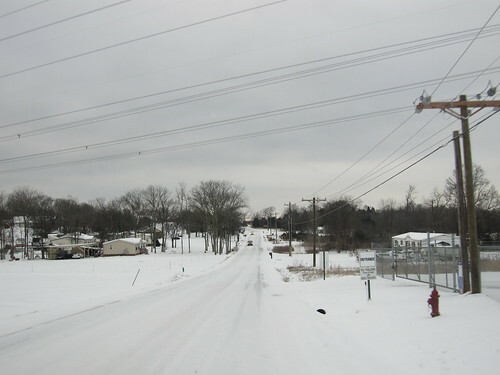 It’s true that we don’t know how to drive in it, but it’s also true that the local government is not prepared for it with plows and salt trucks, especially for more than just a dusting. I’ve been at home since I got home Thursday afternoon. I did leave once on Saturday with my dad in his 4×4 to scope out the roads. It took us 45 minutes to make the 5 mile round trip to one of the local gas stations, and my place of work is 17 miles from home. Needless to say, I had no interest in driving until the roads were all clear. I got up this morning, anticipating going into work, until the news reported ice and numerous accidents in the area where I would have to drive to work. One of the country roads a few miles from my house on the way into town. 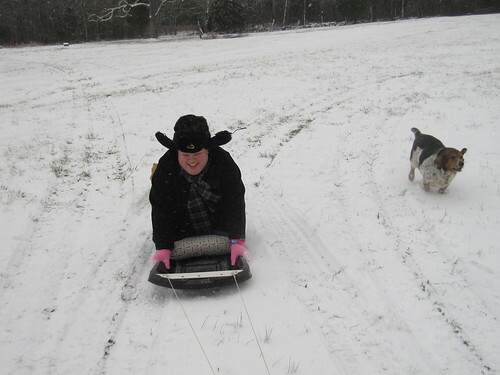 For the first time in a very long time, we had enough snow to go sledding! However, all of this hibernation wasn’t in vain. 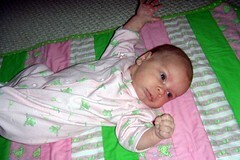 My mom and I both got a lot of sewing done, including two baby quilts that I completed. I can’t show you pictures of the completed quilts just yet, because I want the recipients to be the first to see them, but here’s a sneak peek until then. 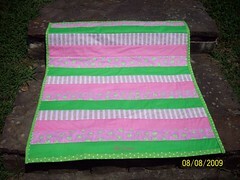 This project was a Quilt-As-You-Go that I got as an idea at Fabric Boutique. The idea is to use strips from a jelly roll, along with spray adhesive (the kind that washes out and is safe on fabrics…can be found in most fabric or quilt shops), your batting and binding, then sew it all together one strip at a time. I couldn’t buy the kit while I was in Las Vegas in April because I couldn’t bring the spray adhesive on the plane with me, and that’s just too much to carry on a plane, anyway (as it is, I came back with 53 pounds of luggage from Vegas, thanks to all the quilt shop hops I did!). So I kept the idea in my head and did it my own way. It’s not technically made from a Jelly Roll set, but I did cut the strips as in jelly roll fashion. 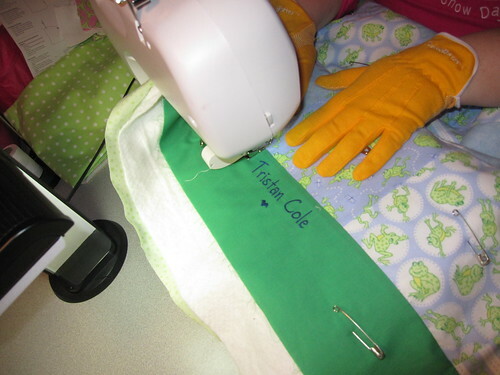 The concept of Quilt-As-You-Go is an awesome method for me in making these baby quilts for friends because they can be made in much less time, because I’m sewing about half as much. It’s also easier because the quilts are smaller than most. I’m still not fast enough to make a quilt in a day, but this method sure lessened the work, which made it go by much faster. 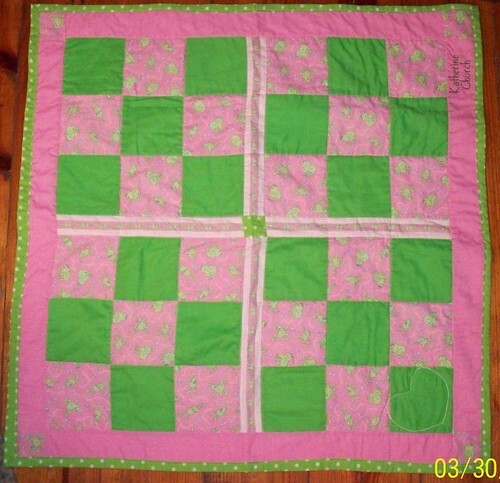 While I’m trying to make each of the baby quilts slightly different, I will probably use a similar method on the next baby quilt that I make. 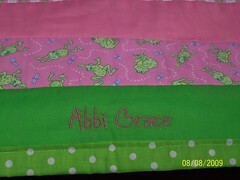 I made this for a friend’s baby shower for her baby due in September, Abbi Grace. If you are interested in the kit above, Fabric Boutique sells the complete kit on their website. Just look under kits, and it’s the third one down (as of 8/29/09). 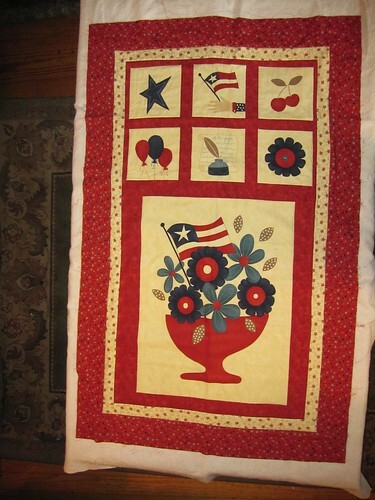 I completed this charming Dutch Treat back in July to give to my boyfriend’s mother, Judy. The project was made from a kit that I purchased at Fiddlesticks in Boulder City, Nevada back in April. It was a small project but the first one that I have completed where I did the binding the “correct way,” (meaning that I didn’t fold over the backing then bind on the front), and I did it without any help, so who knows if it was really done correctly! 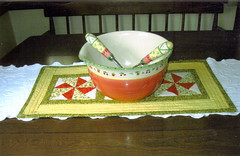 I should have recorded the dimensions, but it was a relatively small project that Judy is using as kitchen table centerpiee and just happens to match PERFECTLY with a salad bowl that my boyfriend, David, gave her awhile back. The front and back pictures of the Dutch Treat. I wish I had taken pictures of the salad bowl with it! 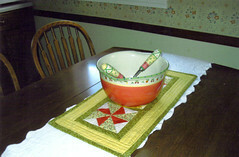 Judy sent me pictures of the centerpiece and salad bowl set that David had given her. I still can’t believe how perfectly they match! 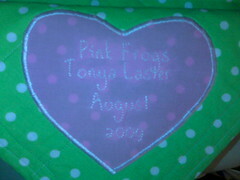 This is a small quilt that I made to celebrate the adoption of a friend’s baby. It’s a basic 9 patch that I pieced together on my own with my own touch and variation. 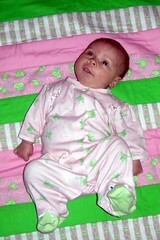 The quilt was a gift to friends who had just finalized the adoption with their 7-month old daughter. I also made a pillow case for a travel-sized pillow to go with the quilt. To see pictures from the beginning of the project through completion, visit the Flickr Set for the quilt.